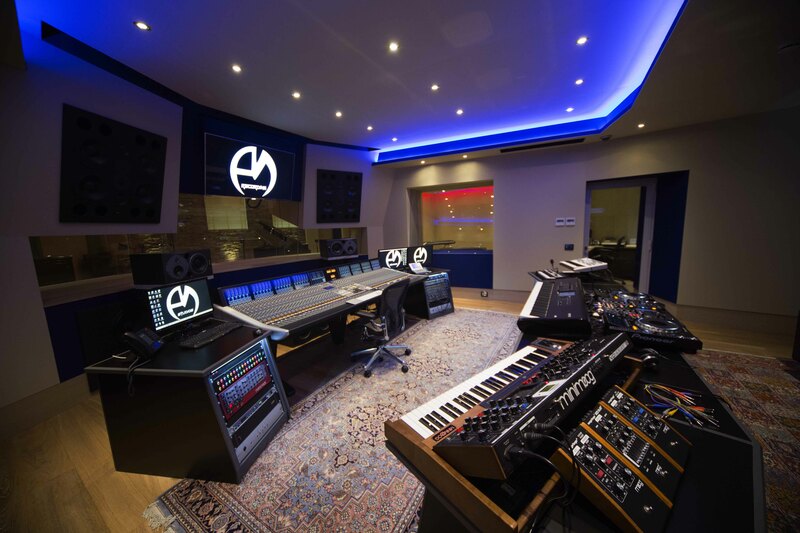 With its 50m square of surface, its big frontal window screen and its lateral windows that allow it to have a full view of every section, the Control Room A, other than being one of the best of its kind in Europe, it’s the biggest of the studios. Prestigious machinery such as console Solid State Logic (SSL) Duality 48 channels, Apple, Avalon, Avid Pro Tools HDX, Dynaudio Acoustics m4+ and Air 20, Korg, Manley, Neumann, Nord, Pioneer, Royer, Steinberg, TC Electronic System 6000, Virus and Yamaha are only a few of the instruments used to reach top-quality simultaneous multi-tracks recording in 48 channels in six different recording booths. Control Room A, other than being totally wired to direct Full HD videos, it communicates both with Control Room B and Control Room C. Designed to record audio, mix and stereo master, it also offers the possibility to film Full HD videos and 4k of very high quality, from pre-production, to recording to editing. 40 meters square of surface dedicated to a native console with a CEE Dolby Surround 5.1, 6.1, 7.2 stereo DTS and stereo certification for mixing and mastering.